Climate Change: The Next Generation: World's largest ice sheets melting at fastest rate ever recorded - twice as fast as five years ago! World's largest ice sheets melting at fastest rate ever recorded - twice as fast as five years ago! Record decline of ice sheets: For the first time scientists map elevation changes of Greenlandic and Antarctic glaciers This doesn't look good. What is that expression? "This is not going to turn out well." Researchers from the Alfred Wegener Institute, Helmholtz Centre for Polar and Marine Research (AWI), have for the first time extensively mapped Greenland’s and Antarctica’s ice sheets with the help of the ESA satellite CryoSat-2 and have thus been able to prove that the ice crusts of both regions momentarily decline at an unprecedented rate. In total the ice sheets are losing around 500 cubic kilometres of ice per year. This ice mass corresponds to a layer that is about 600 metres thick and would stretch out over the entire metropolitan area of Hamburg, Germany's second largest city. The maps and results of this study are published today in The Cryosphere, an open access journal of the European Geosciences Union (EGU). 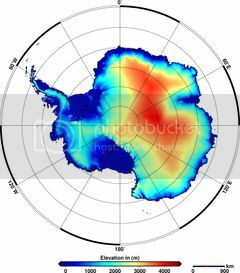 The team derived the elevation change maps using over 200 million SIRAL data points for Antarctica and around 14.3 million data points for Greenland. The results reveal that Greenland alone is reducing in volume by about 375 cubic kilometres per year. “When we compare the current data with those from the ICESat satellite from the year 2009, the volume loss in Greenland has doubled since then. The loss of the West Antarctic Ice Sheet has in the same time span increased by a factor of 3. Combined the two ice sheets are thinning at a rate of 500 cubic kilometres per year. That is the highest speed observed since altimetry satellite records began about 20 years ago,” says AWI glaciologist Prof. Dr. Angelika Humbert, another of the study’s authors. Scientists did discover that the East Antarctica is gaining volume – this gain is not enough to compensate for the larger losses elsewhere. This sad news combined with my report last night that Professor Tung believes the current degree (no pun intended – but when you are hot, you're hot!) of global warming is missing an enormous amount of heat being "diverted" to deep ocean build-up do to a 60-year cycle in Atlantic ocean currents. We are entering the last decade of the "down cycle," so he expects the temperature measured in our atmosphere to take an extra upwards bump in 10 years. On a more upbeat note please support the People's Climate March being organized by boatsie and others here. This post is not part of our marathon, but breaking news, so please go over to People’s Climate March swells to global mobilisation for action and support our drive.